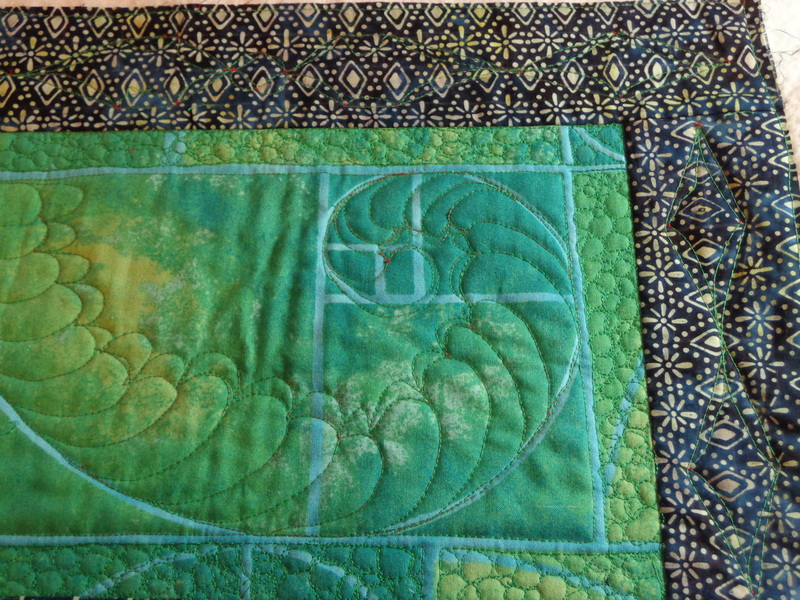 This last little quilt of my “three little quilt series” is a second Fibonacci quilt, made with the same green Fibonacci fabric, but this is with a different border. 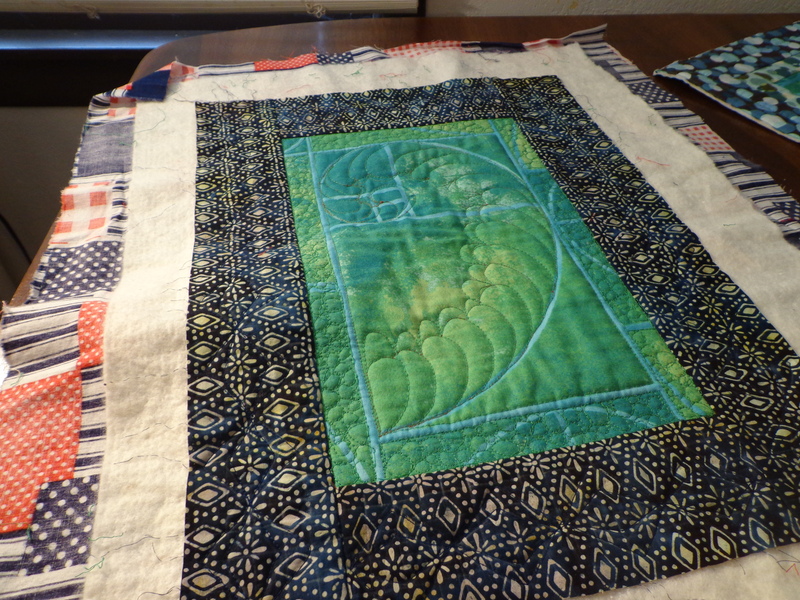 I am less in love with this little border than the cute bubble border on the last Fibonacci quilt but I am leaving it, I quilted it up a little more. 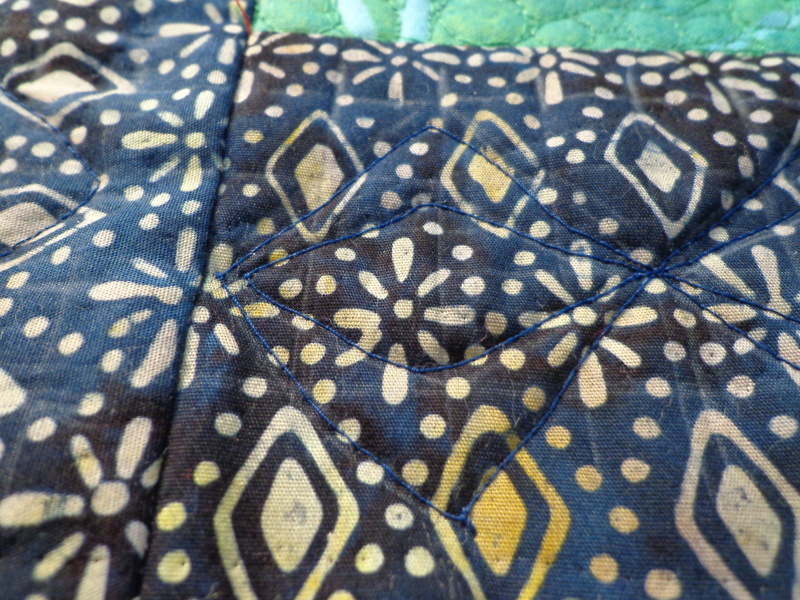 This is also the quilt that on these little borders, I unquilted what I had done, and I had also learned a valuable lesson about bobbin thread. 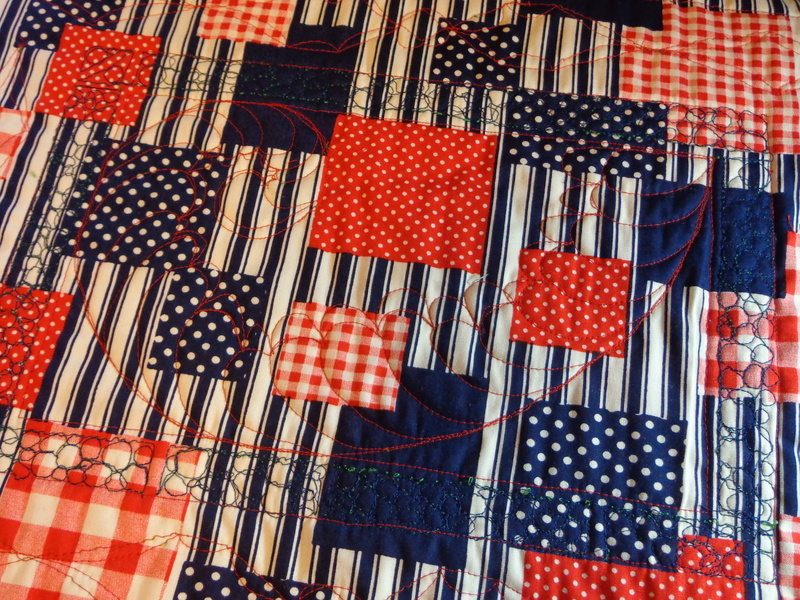 I am going to show you backwards, the “finished quilting picture” and then move back to show the changes and details. I call this quilt Feather Fibonacci. Lets look at the inside fibonacci feather first. I have been taking the class “beyond the basics” over on craftsy. And Ann Peterson has you do a ton of feathers. Well I watched all through the video, of them drawing the feathers, and then quilting them, and I decided the spiral arm looks like a feather spine. I actually have drawn a couple of times some feathers on my little graph paper notebook some feathers, working out how to move from one feather to the next without always going back to the spine the way Ann does. And after seeing some close up posts on feathers, I decided to use the method – Start one feather, branch that from the spine, connect to the first feather, then travel the tip of the 2nd feather. then branch off the feather end. And continue in this way, feather, spine, trace over feather, feather, spine, trace over feather…. Which is an efficient way to quilt but takes some getting used to if you want plump feathers coming off instead of long skinny ones. Not too terrible for my attempt. Valuable lesson on this quilt #1. You don’t have to match the backing fabric to the front, but don’t use a contrasting thread in the bobbin from the front of the quilt. Unless your tension is A-100% perfect and can always control your needle, that bobbin thread is going to show through. Now I admit I wasn’t as ‘analytical’ (read the shortened version of the word) on getting the tension perfect before-hand, so I am not surprised. But I did it and kept going, even when I saw the red thread piling up on the green fabric. Why I chose red thread for the back? I don’t know. Probably had more to do with the fact that I had red thread on the bobbin already and I did not have a dark blue on another bobbin. You can see that for the pebbling practice (aka practice from Craftsy Quilting Negative Spaces with Angela Walters), I chose blue bobbin thread and this was no problem at all. Only because I ripped out 5 pebbles that looked horrendous with red thread. 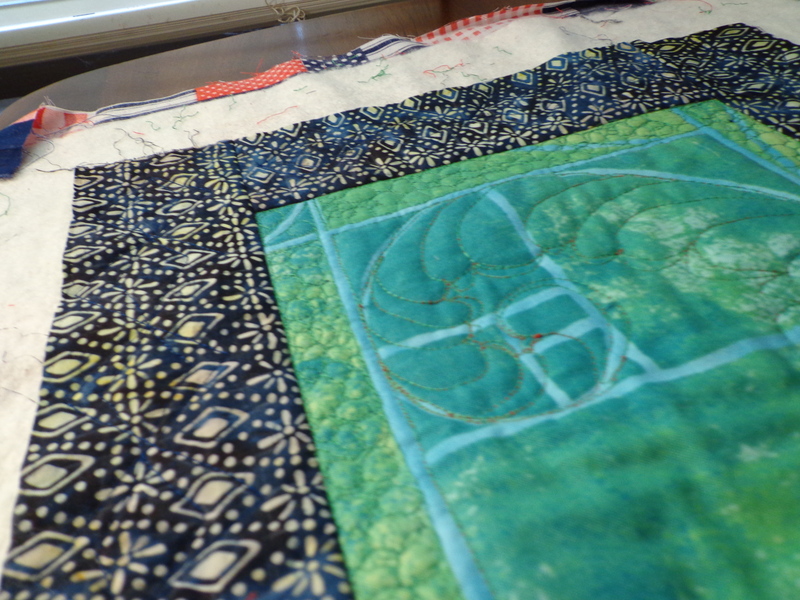 The borders of this quilt are dark blue with lots of pattern. no issue with the red bleeding out. 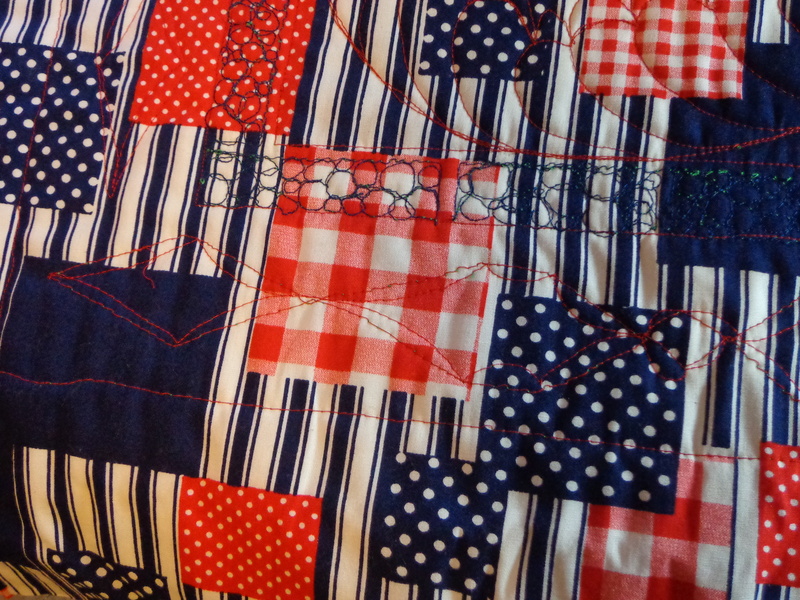 But I didn’t like the quilting done initially on the borders. It was my design and I did not like. The long diamonds just didn’t work all that well for me. I couldn’t execute them well. They were sagging in the middle, and it kept feeling very ‘draggy’ making them. So I picked them out, watching a bit more of the craftsy class. And then decided to remake them. Same design. Each one shorter Blue on both top & bottom. Looking closely I still have some tension issues, but now I don’t notice them. And the design is tighter, it’s more coherent, and travels better down the quilt. But it does blend in so much, it’s really providing texture rather than design. So where do I go from here? I think I will NOT rip out the feather despite the red thread showing through. But I will play it up a tiny bit as intentional – provides some interest. The way I’ll do this I think is to have a very thin red line of piping around the side of the binding. To make the binding dark blue or green (probably blue) and then a tiny bit of red, just a tiny bit, it will be interesting in color just enough, and then I can move on. But … one issue. I’ve never done piping on a quilt before. Next thing to learn. Although the kicker binding will give me some practice enough!